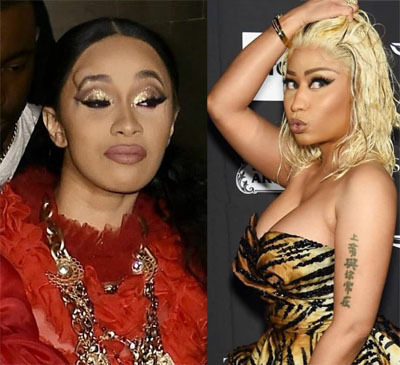 The scuffle began after rapper Cardi approached Minaj over “lies Nicki was spreading”, a celebrity website TMZ said. She was allegedly elbowed in the face by a security guard before throwing a red-heeled shoe at Minaj, who appeared unscathed from the incident. Eyewitnesses told US media the altercation took place on the first floor balcony of the Harper’s Bazaar ICONS party, during a performance by Christina Aguilera. Cardi, who was wearing a red Dolce & Gabbana gown, is seen in social media video lunging forward after reality TV star Rah Ali, a friend of Minaj, stepped in between the two rappers. Within seconds, security guards separated the entourages. Minaj, who recently released her fourth album ‘Queen’, later shared pictures of herself posing in a leopard print ball gown. Cardi, however, addressed the incident with her rap rival in a statement on Instagram (which contains swearing). The rapper, who has achieved huge success over the last year with hits such as ‘Bodak Yellow’ and ‘I Like It’, said she had let a lot of things slide. She also accused 34-year-old Minaj of threatening other artistes in the industry, allegedly telling them if they worked with Cardi, she would sever ties with them. Cardi then explained,”But when you mention my child, you choose to like comments about me as a mother, make comments about my abilities to take care of my daughter” that is when the rap star said all bets are off. Cardi B, whose real name is Belcalis Almanzar, gave birth to her first child Kulture in July. The 25-year-old pulled out of her tour with Bruno Mars later this year, admitting she had “underestimated this whole mommy thing”. At the MTV Music Awards in August, Cardi B made comments that were perceived as a barb at Minaj’s expense. The two rappers had previously denied there being a rift between them, despite repeated suggestion of subtle digs in each other’s lyrics.